Her ears are double pierced. Numerous rings, watch worn on left wrist. Unknown. Crystal was last seen in the morning hours at the Shaw's Corner Store in the vicinity of Jones Avenue and Main Street in Andrews, South Carolina. She called her father to pick her up, but he was unable to, and she told him she would walk home. She has never been heard from again. 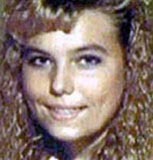 Her case remains unsolved.